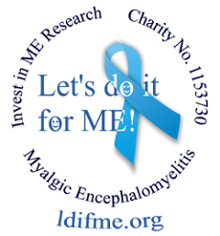 First posted for ME Awareness Month in May, the good news is there's now a range of easy ways for you to raise awareness all year round of Myalgic Encephalomyelitis - all far easier than spelling it! 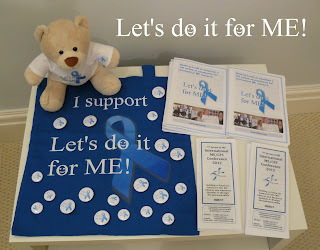 In previous posts we've highlighted our Standard and Designer Spreadshirt shops and Carmel's ME Awareness shops. 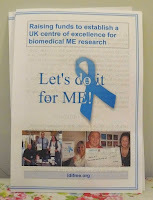 They each provide a wide range of awareness items and all funds generated go directly to Invest in ME and biomedical ME research in Norwich. But there are many more ways to raise awareness if you aren't in the market for a new t-shirt, teddy or mug. Print-off our leaflets and hand them out to friends and family, to your GP or consultant or to local journalists - along with some details of your story if possible. Our leaflets give a simple explanation of our campaign and list ways your friends and relatives can get involved including raising funds for free whenever they shop online. Giles Meehan's video explanation of our campaign is also a good way of getting relatives, friends, medical professionals, or maybe your MP up-to-speed. Our badges come in packs of 5 with £1 raised for biomedical research. 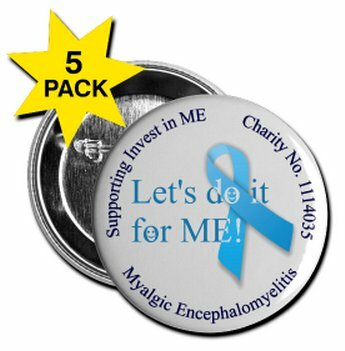 Badges can be re-sold with profits going to Invest in ME or given away to raise awareness. 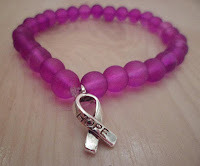 Pin them to a coat, bag or briefcase to raise awareness on the go or give them as a gift to friends and relatives to wear to highlight our cause. The BIG CAUSE slogan is used to emphasise the great need for proper research into this disease - something that has been lacking in any government strategy over the years. 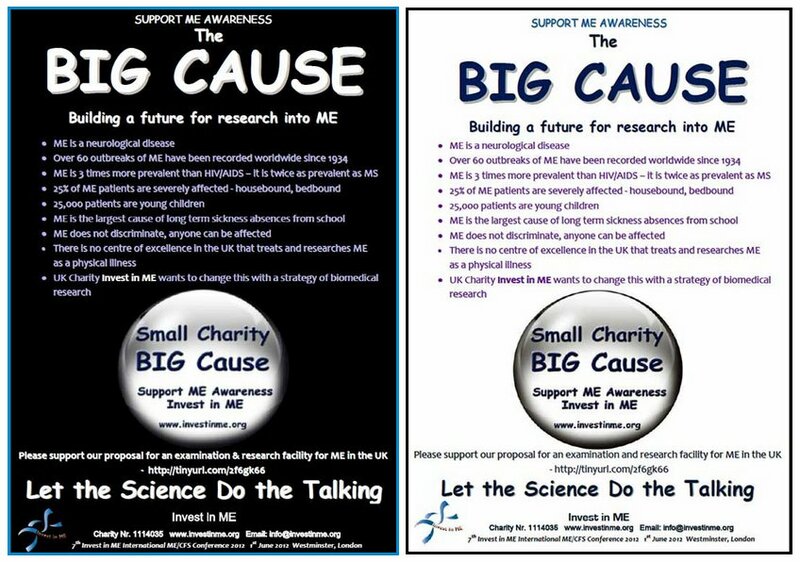 IiME International Biomedical Research Conference leaflets and Burst Our Bubble campaign posters are also available and IiME can provide ME Awareness support packs. 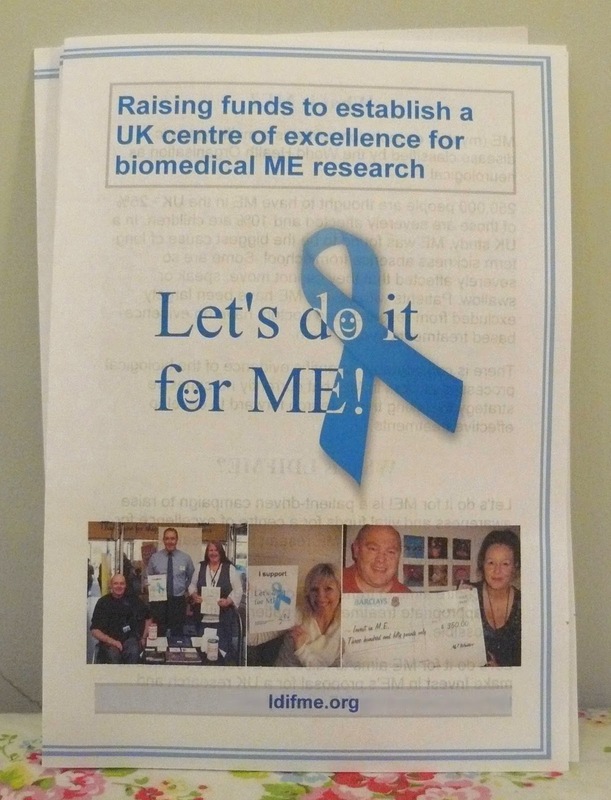 We have seven poster designs available that have been created in support of Let's do it for ME and Invest in ME charity by members of the Let's do it for ME planning group. All of which are free to save, share and print for awareness raising purposes. With thanks to all those involved in the making of these posters, and to those who feature in them and have given permission for the use of photos. Take your pick and put them up in your hallway or window, your doctor's waiting room or local library - seek permission first where necessary. 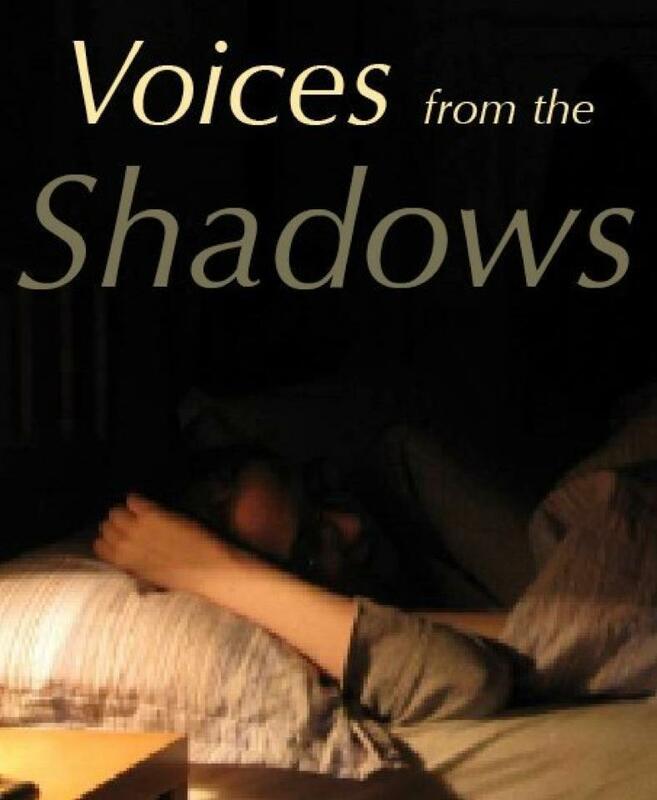 Julia Cottam's Big Sleep awareness and fundraising event is all about inclusivity and there are different degrees to which you can get involved depending on your ability level and available free time. 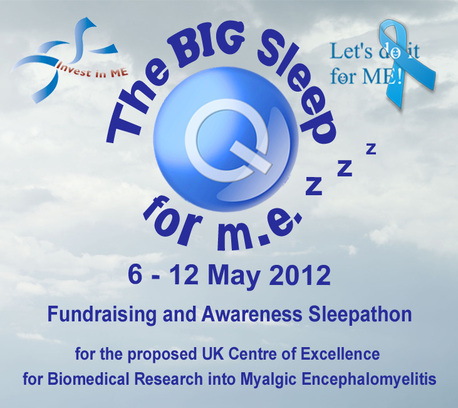 The 'lightest' option is as simple as it gets TEXT BSME99 and the amount you wish to donate, for example BSME99 £5, to 70070. Then smugly put your feet up and do nothing for as long as you wish in the comfort of knowing you are doing it for charity and supporting people with ME and biomedical ME research! Blue "www.investinme.org - Support Biomedical Research into ME" wrist bands are available in packs of 5 from Invest in ME. 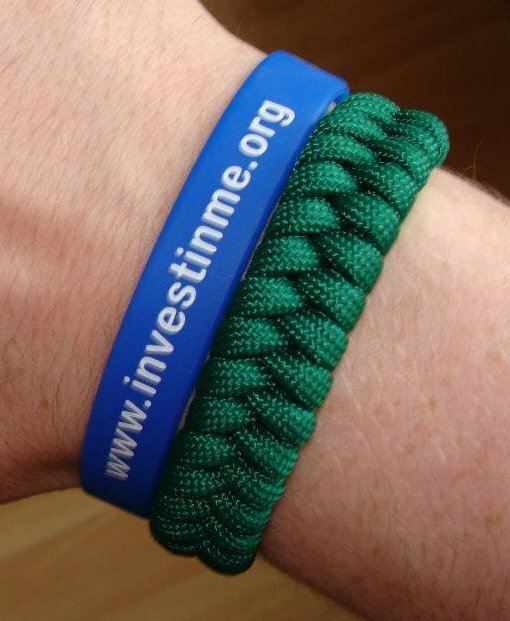 We also have a wide selection of other awareness bands and bracelets available from Make ME Crafts a website set up to sell crafts in support of LDIFME and Invest in ME. 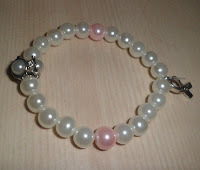 Whether it's paracord or pearls that float your boat wear them with pride and sell them to friends, family, work colleagues - even in your local library, GP surgery or hospital. 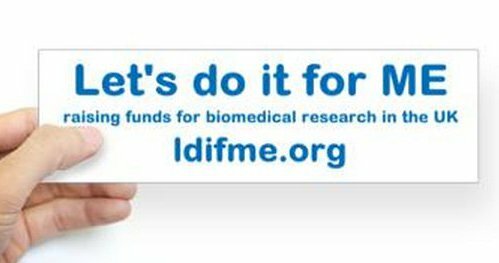 Buy yourself, your friends or family one of these awareness raising car bumper stickers to highlight the need for biomedical ME research all year round, versions are also available with Invest in ME's details on. 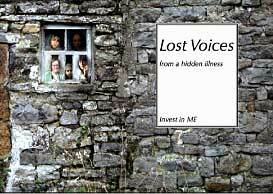 Voices from the Shadows film developed from Lost Voices a book available from Invest in ME that contains stories and photographs from people with severe ME and their families and carers. Art has the power to move people, and combined with documentation Lost Voices brings the situation more vividly to life. However you decide to raise awareness this year - Let's do it for ME!